Ry and I went shopping last night. I had to return my boots to Kohl's, we ran into Christmas Tree Shop, and then went to the Pottery Barn Outlet. Remember Mitch and I went there on Sat. and they didn't have anything great? But I went there a couple weeks ago and found my pendant for cheap so I thought maybe I'd score again. Well we looked around for a while but to no avail. They hadn't gotten in any new lighting. Shoot. Oh well...maybe next time. Ry spotted a play kitchen over in the kids' section so we were over there for a while "washing dishes." When it was time to leave I told Ry I just wanted to look around again one last time. So over to the lighting section I went. And what do you know--the PB lady was just putting out some new lights. So as I was scouring the new goods, she comes out with yet another cart of lights. Nice. And there was one more shipment that arrived shortly after. So among all those lights I found these. This one will be going in Ry's room (our current bedroom.) 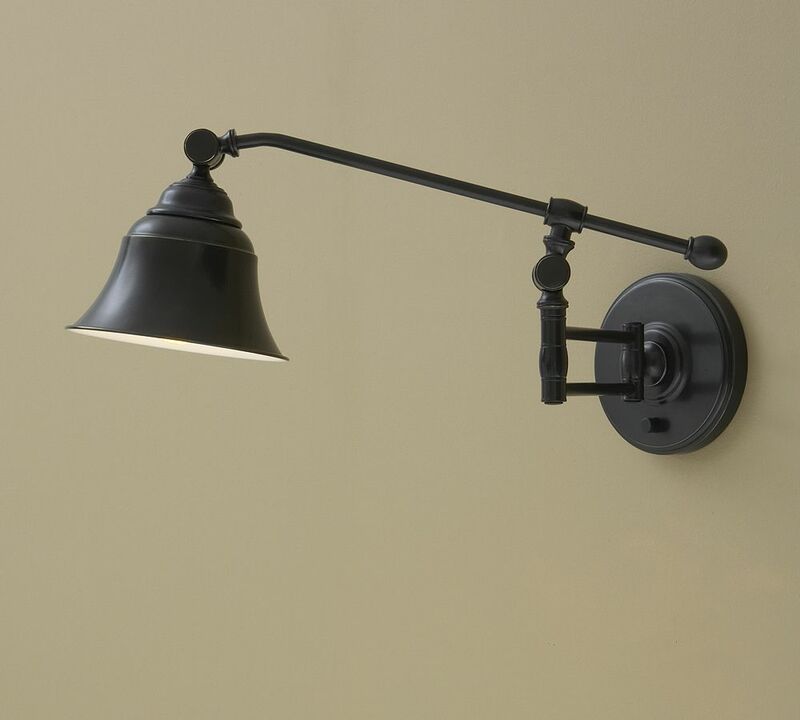 We've been looking for a sconce that you can switch on and off. Our current one is so ghetto. It looks nice but it's impractical. I have to twist the bulb to turn it on and off. So needless to say, it doesn't get used much. I love this one. It's the Wyatt Sconce that's currently selling for $139. Next is the Halton Chandelier. It's pretty, isn't it? This is for my friend Jess. 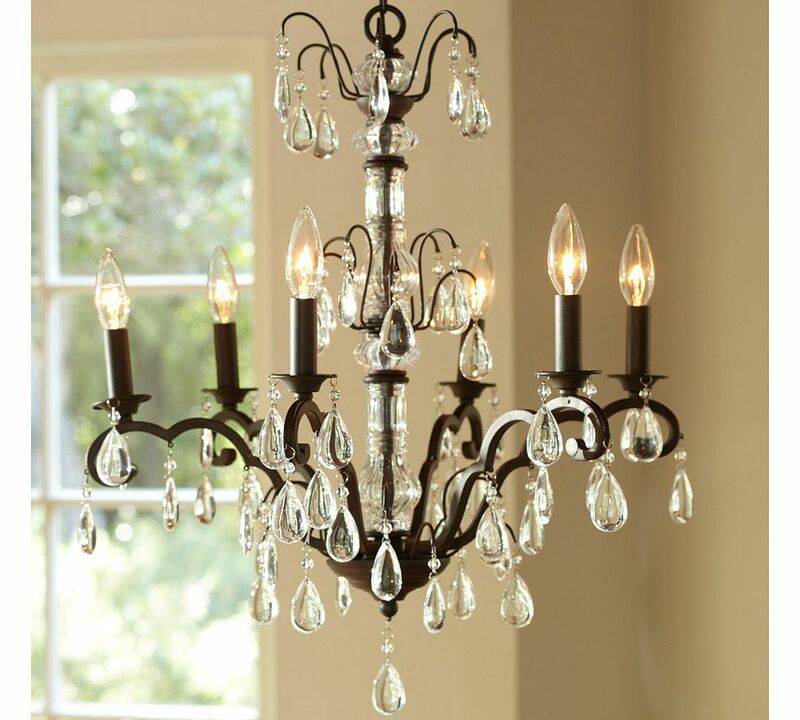 She's been wanting to replace the chandy in her dining room and the cheapest one she found was at Lowe's and it was still over $100. This is a new one on the PB website and it's $299. Then this one will be going in our stairwell. 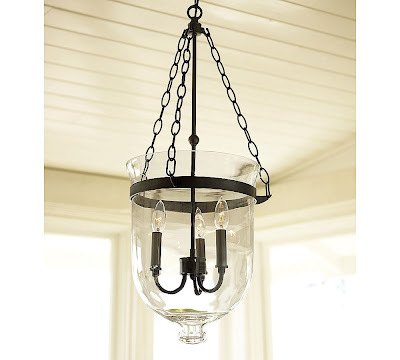 It's the Hundi Lantern and it's selling for $269. 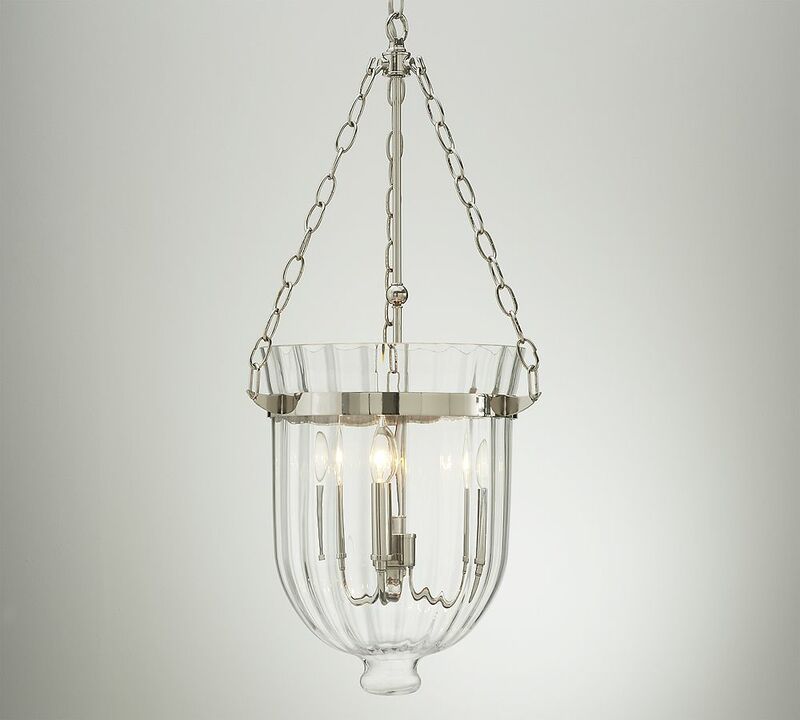 And this one is the Ribbed Glass Hundi Lantern which is $299. Not exactly sure where this one is going. I'm thinking above the dining room table. The one I got is the same color as the previous one. It's the bronze finish. Notice the wavy glass. Yum. And I got one more chandelier for above our tub which I can't find anywhere online. It's dripping with crystals. Feminine. Flowery. Whimsical. It'll look so nice above the tub, I think. You'll have to wait for a picture once I have it up. So there ya have it. 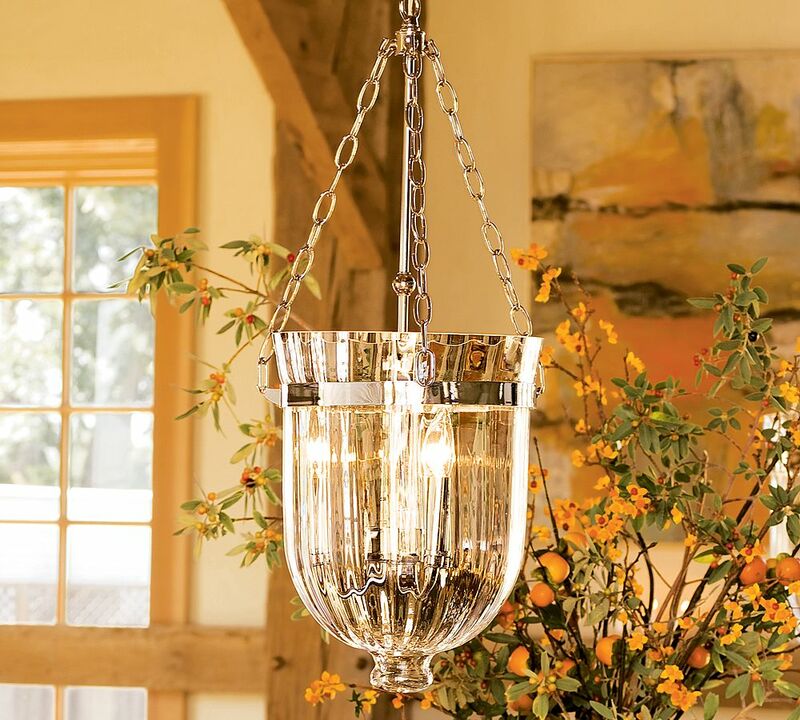 Four light fixtures that retail right now for a total of $1,006. 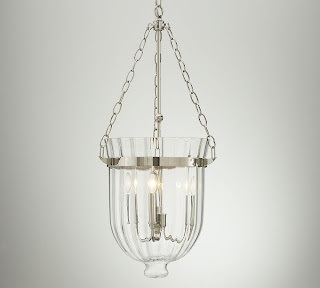 And I don't know how much the bathroom chandy goes for since I can't find it. But anyway, I paid $134.90 for all five. The bathroom chandy was only $4.98. Yeah, I'm not joking. I want to share these finds with you not to toot my own thrifty horn but let you know that you can get what you want even if you're on a tight budget--as long as you're willing to be patient and look around. So many people just buy things. They see something that they like and they just buy it whether or not they can afford it. And that can get you in some serious trouble. Mitch and I have learned to just be patient and we've been so blessed to be able to get things that we love. Many times the exact thing we had our eye on. God has definitely been good to us. So if I can impart one frugal tip to you, just be patient! We all know good things come to those who wait. Well said! God is very good to us. Thanks for thinking about me! I've been sick and busy so have just now got around to checking email and blogs. Those are some amazing deals. The light in my dining room is like the Hundi. I wanted the Hundi but didn't want to pay for it. So jealous! The subtitle of your blog says that you are a "bargain finder" and YOU SURE ARE! This has to be the neatest "thrift find" for the week at "Thrifty Tuesday". Congratulations!